I'm happy to say that I made it through the holidays, and didn't miss a beat with training. Usually I slack off a bit this time of the year, but I'm so focused right now that it wasn't even an option. The weather was all over the place this week, but luckily didn't stop me at all. Dan and I traveled to visit his family for the holidays, so you'll notice a few new routes that I ran! I had some great workouts this week- here's a look at how I did! I headed over to a small lake in Boiling Springs with Dan and his dad. They both brought along dogs to walk around with, while I ran a few laps around the lake and neighborhood. It wasn't the most fun run, and it was pretty miserable out, but I made it! Back at the house, I did my yoga video and core workout. I felt like I woke up in a completely different state or month, because the weather went from cold and grey to warm and sunny! It was a beautiful day and perfect weather for a speed workout. This was called an "ice cream sandwich", and the workout was- after warming up, run 2 miles at 15 seconds slower than half marathon pace, then 6 hill sprints (each repeat should be 30 seconds), followed by another 2 miles at 15 seconds slower than HMP and a cool down. 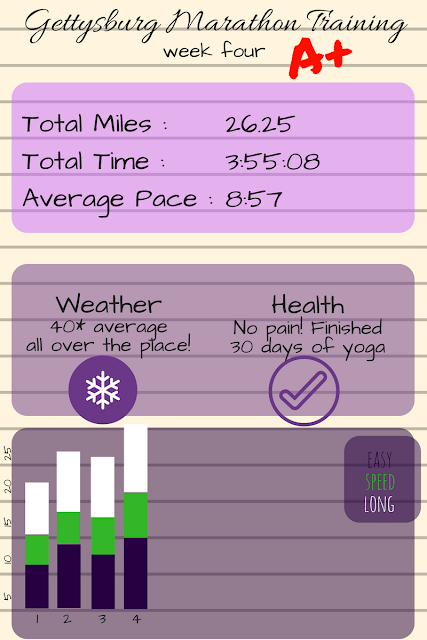 My goal pace for this run was 8:15, since I'm hoping to run 8:00 miles for my goal race. I felt really good for this entire workout, and each mile ended up being exactly 7:57. Surprisingly, I felt my best in the mile after hill repeats. I think that sprinting and going up a steep hill helped to stretch out my body and activate different muscles. I expected this workout to be harder, but I really enjoyed it and it was a great confidence booster! I ended up soaking my feet in a creek at the park, which was a natural ice bath (my little water dog had to get in too..she loves swimming)! When I got back to the house, I did yoga in the sunroom since it was so nice out. We traveled home on Wednesday so I skipped a run. When I got home I did my yoga video, which felt great after sitting for so long. I took this run really easy. I want to concentrate on making my easy runs truly easy while I'm picking up mileage. There's no use racing through recovery miles! My goal was to keep it over 9:30 pace, so this felt really good. In the evening I did my yoga video and another core workout. I was originally planning on taking a day trip with my mom to visit my grandparents, but we got hit with an unexpected snow storm. The roads were really icy, and we have to drive though mountains to meet them. We postponed the trip and ended up getting brunch. I relaxed the rest of the day and ended with the final yoga video of the 30 day challenge! It was really fitting for me that my final run of 2016 was my first double digit run of my training cycle. This was also the first time I ran over 10 miles since my half marathon in October! I had brunch plans in the morning and was going back and forth about postponing my run for Sunday. After changing my clothes "just in case" I finally convinced myself to get it over with and did two laps around North Park. I felt really good on this run! I took the first lap pretty easy and ran it in 46:23, then picked up my pace for the second lap and ran it in 44:51. Overall the pace felt really good and I felt comfortable the entire run. Dan, Selma and I headed out to the park to do a little run together. It was really crowded out but such a nice day. I was excited to do this run so that I could hit 26.2 miles for the week! Afterwards, we went to the dog park and Selma made a ton of new friends. It did feel like spring for a few days didn't it? I've actually ran around that lake in Boiling Springs! I think that's the one near the AT right? Yes! I love that lake. I'm so impressed that you were able to stick to your schedule despite all of the holiday and travel craziness! Thanks for sharing the "ice cream sandwich" workout! Good job hitting your fast and easy paces. Keeping the easy runs easy is something I'm really trying to work on as well. Thanks Tracy!! That workout is great..I hope you like it! I can't believe how nice your weather has been! I can't IMAGINE being hot enough to be able to stand in a creek. It is so frigid and icy here right now. Nice job on your mileage last week. I give you a gold star for your A+! That speed workout sounds tough. Awesome that you nailed it! Congrats on doing so great with training through the holidays! Thanks Jennifer!! I will miss being able to run at whatever I want but it's nice to be back to a routine. Way to go on keeping up with the training over the holiday season - and with constantly changing weather! You are awesome, girl!